Good morning! I'm playing along with two challenges with this card that I made with an extra background I made for this card, ages ago. It worked so well for a frosty background, but I think it works for a pretty spring background, too! 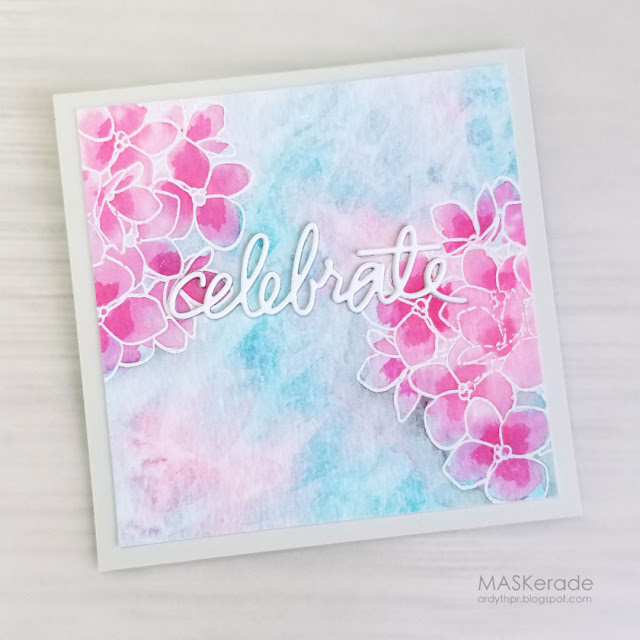 I started with my pretty, frosty background and stamped and embossed Mondo Hydrangea into some pink areas. Then, I watercoloured the flowers in a brighter pink for more contrast. I die cut and stacked my sentiment so that it would be legible on the background. And for my card base, I used the new Oyster Gray cardstock from Ellen Hutson. It is a lovely soft colour, very smooth and perfect weight for a card base. Such a gorgeous addition to our CTS gallery, Ardyth... and frame-worthy! This is gorgeous Ardyth! That background is perfect for those pretty pink flowers. Thanks so much for joining us at The Card Concept. Oh my gosh, this is stunning! WOW, love it. Absolutely beautiful, Ardyth ! First of all hydrangea is my favourite flower and I love how you used an "old" extra background to make this new card. And what a stunning result ! It's a winner for me ! Thanks so much for sharing and for inspiring. The hydrangea blooms are beautiful! Thanks for sharing with us at the Card Concept Challenge! so beautiful, love the background colours and the pinks brighter on the flowers, so eye catching. What a winner.